AngoraGarnet is a small, family operated farm in Rörmyr placed 10 kilometers south of Stromstad in northern Bohuslän. Among the many animals on our farm are angora rabbits, which are the foundation of our business. Rabbit fur makes the most gorgeous, soft, and lightweight wool. And it has amazing properties . In addition to its strength and capacity for thermal insulation, it absorbs many times more moisture than sheep’s wool, wicking it away from the body so that you don’t feel damp. This is due to the structure of the fur’s fiber. 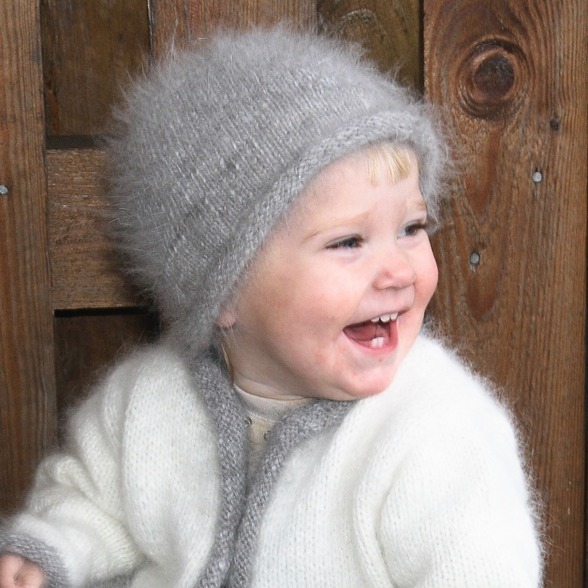 Of the rabbits gorgeous soft and lightweight wool the softest yarn imaginable is spun. Angorawool has superb features. In addition to its thermal insulation capacity and strength angora wool can obtain many times more water without feeling wet compared to sheepwool due to the angorawools fibrillar structure. In our farm shop and our E-Shop we supply angora yarn in soft natural colors, as well as plant dyed yarns in stronger tones and more muted shades that blend together. Our farm shop is filled with knitted samples of "Silfverberg Knit Design" that are meant to inspire you. We also carry knitting kits for our designs, yarn, knitting supplies, patterns, and finished projects. ♥ To produce quality yarns and wool products from our own angora rabbits. ♥ To develop knitwear designs for "Silfverberg Design" that are simple, elegant and useful. ♥ To provide knitting patterns so clear that anyone who wishes to can share the joy of knitting with us. ♥ We wish to increase interest in the craft and art of knitting. ♥ We wish to educate our customers about angora wool; an amazing natural material with very special properties. ♥ We want to bring joy, warmth, peace, and harmony into your home. Shop angora yarn and knitting design in our E-Shop.